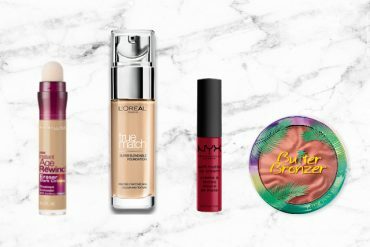 Save hundreds on makeup concealers and foundations by investing in one of these best eye creams in Singapore! Read on for the type of eye creams you’d need for puffy eyes, wrinkly eyes and for eyes that need that extra boost of hydration. 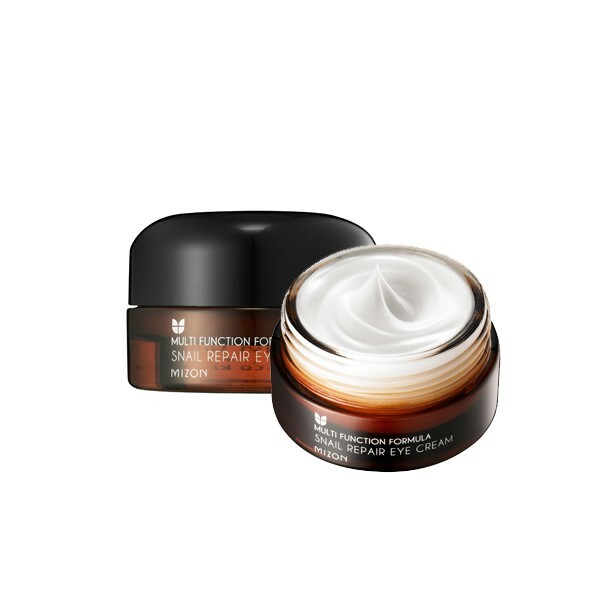 We’ve also included an eye cream that doubles up as a face moisturiser! Eye creams are controversial products with some saying that you need them and some saying you don’t. We are of the former camp. Our under eye area could use some extra TLC as they are usually the first areas to show signs of ageing. Skin around the eye is sensitive, thinner and more fragile than skin on the rest of the body and even face. 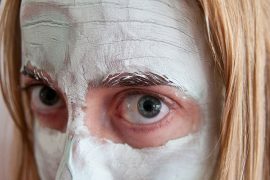 Even though many use their face moisturisers on their under eye, this may not be the best option. Absorption levels on the under eye is faster and thus, a gently formulated and more lightweight eye cream is more suitable. When Is The Best Time To Start On An Eye Cream? Again this is divisive, but the recommended time to start using eye cream is in your twenties. To start off, use a lightweight eye cream. However, if you already start noticing dark circles then you can start investing in more targeted eye cream products. 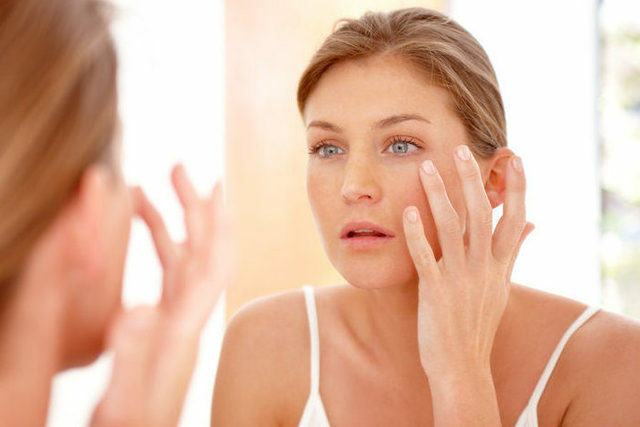 Look out for eye creams which are hypoallergenic and fragrance-free. Antioxidants like Vitamin C are important ingredients too as they help prevent the breakdown of collagen which is what causes wrinkles in the long-run. However, do keep in mind that eye creams are not miracle workers and they may not be able to completely fix all your under eye woes — but they will be able to fend them off for much longer! For Those Pesky Dark Eye Circles! Mizon is a name renowned in the K-beauty world and the Mizon Snail Repair Eye Cream (available on MIZON Studio) is one of their best-selling products. It’s made from 80% snail mucin and is touted to be able to reduce fine lines and wrinkles around the eyes. Most importantly, it contains Niacinamide which tackles dark eye bags and leaves you with a brightened and rejuvenated under eye area. If you’re already a fan of the sister product, All-In-One Snail Repair Cream (available on MIZON Studio), complete your skincare routine with the Mizon Snail Repair Eye cream. With rave reviews, this is one of the best eye creams to get in Singapore! We know how frustrating it can be to have under eye bags looking back at you in the mirror and neither do we want to have to conceal it with layers of foundation and makeup every time we go out. So aim to nip it in the bud once and for all with one of the best eye creams in Singapore to fight dark circles and puffy eyes! 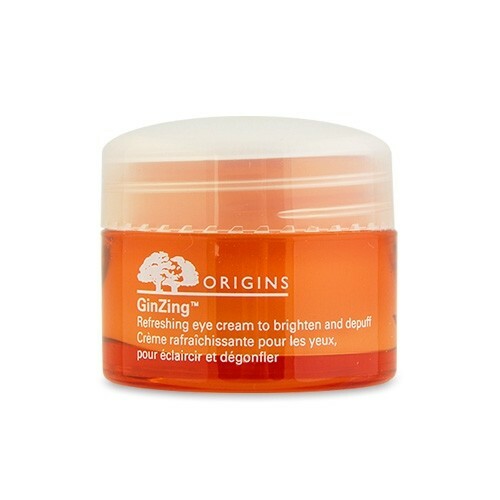 Origins GinZing Refreshing Eye Cream (available on COSME-DE.COM Official) is infused with Coffee Beans, Panax Ginseng, Magnolia extract and natural optic brighteners to give the eye area a much-needed wake-me-up. Coffee beans you ask? Caffeine, in fact, actively treats dark circles and pigmentation by stimulating vasoconstriction. This means it constricts the blood vessels to push out and regulate blood flow — effectively de-puffing the eyes and making them brighter! An eye cream novice? This is one of the best eye creams in Singapore to get for beginners! Cover up evidence of those late party nights with COSRX’s Honey Ceramide Cream (available on COCOMO). It’s formulated with Manuka Honey extract, Ceramide and Adenosine. Ceramide strengthens the skin’s barrier against free radicals while Adenosine has anti-wrinkle benefits and aids in smoothening out the skin. With moisturising and restorative ingredients at the helm of this product, you can be sure your delicate eye skin will be well taken care of! Scoop up a small amount with the spatula (don’t have to worry about bacteria on your fingers anymore!) and gently pat under the eye area using the ring finger. Users have commented saying that it dries to an invisible matte finish leaving a non-greasy canvas, perfect for makeup application. We also hear that COSRX’s Honey Ceramide Full Moisture Cream (available on COCOMO) is the best moisturiser to pair this eye cream with! This list would be incomplete without mentioning one of the best eco-friendly skincare brands on the market. Korean skincare brand, Innisfree prides itself in delivering products formulated with natural ingredients from Jeju island. The products are free of parabens and come in eco-friendly designed packaging too. We especially like this 30ml tub! 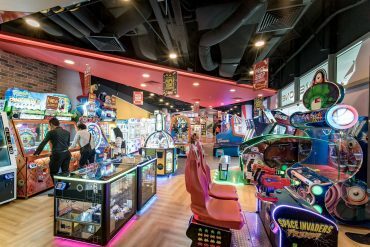 It can be easily slipped into your cabin luggage on those short getaways from Singapore! 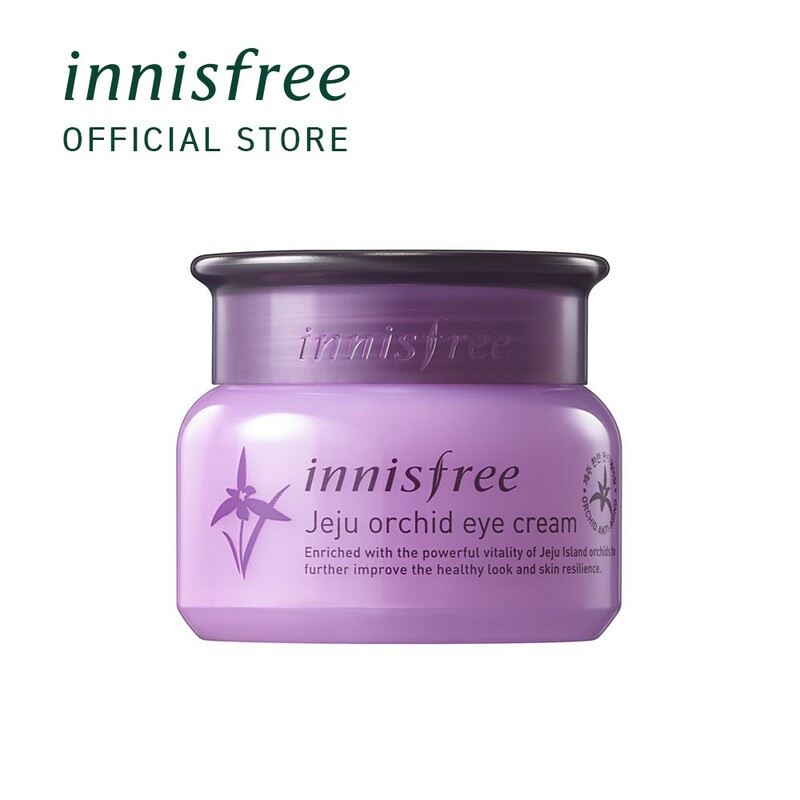 The Jeju Orchid Eye Cream (available on Innisfree) is considered to be one of the best eye creams in Singapore to fight off signs of ageing around the eyes. Its hero ingredient is the Orchid Elixir — an antioxidant that nourishes tired skin and improves the skin’s radiance. Another key ingredient is Squalane — a naturally occurring lipid in our sebum which protects and lubricates our skin. However, as we age, levels of Squalane decreases. That’s where skincare products like eye creams come in! Have oily skin and afraid of flaring your skin up? Fret not! The ingredients in this Orchid Eye Cream like Squalane have been hygrogenated, making it lighter and safe to use for acne-prone skin. Are you someone with more mature skin and tired of experimenting with different skincare products? If you’re looking for a quality product albeit at a slightly higher price point, then turn to the SK-II line for one of the best eye creams in Singapore. 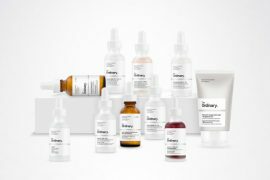 This Japanese skincare brand has been a frontrunner in skincare technology for many years and they don’t plan on stopping anytime soon. 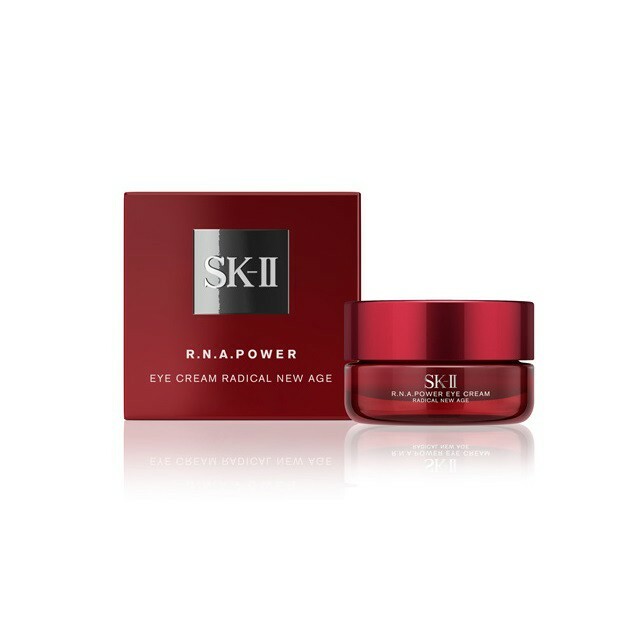 SK-II RNA Eye Cream (available on SHICARA) is a concentrated cream packed with PITERA — SK-II’s trademark ingredient that contains over 50 micro-nutrients like vitamins, minerals, organic acids and mineral acids. Mixed with that is the RNArchitect Complex which contains hydrolyzed soy and yeast extracts to give the skin a firmer and more youthful complexion. Just pat this under your eye after using your facial cleanser and watch it work its magic! Who doesn’t love two-in-one products? We know we do! The A.H.C The Pure Real Eye Cream (available on AHC) works as both an eye and face moisturiser! AHC stands for Aesthetic Hydration Cosmetics and is a Korean skincare brand that first started off as a high-end aesthetic clinic. Since then, it has launched a line of affordable skincare products for all to enjoy. Did we also mention that Anne Hathaway is their brand ambassador? Yup, that’s the brand we’re talking about! Don’t underestimate this teeny sized tube — it packs a punch! Oleanolic Acid fights wrinkles while the Red Salvia Root and Rice extract brightens and moisturises the face and eye area. If you’re hesitant about spending extra cash on eye care products, then get this deceptively simple but one of the best eye creams (and face moisturisers) in Singapore instead! Experiencing dry skin from sitting in an air-conditioned room the whole day? Look for products with Hyaluronic Acid — a key ingredient in helping improve the skin’s absorption rates. Hada Labo, or “Skin Lab” in Japanese, is renowned for their technologically advanced skincare line, making it one of the best eye cream brands in Singapore. Their trademark ingredient, the Super Hyaluronic acid, has two times the moisture retention capacity — leaving you with plumper and supple under eye skin! Hada Labo’s Super Hyaluronic Acid Moisturizing Eye Cream (available on Hada Labo) includes three types of Hyaluronic Acid, Jojoba Oil extracts to smoothen the fine lines around the eyes and ACTIFLOW to increase blood circulation, lighten dark circles and reduce puffiness! If you were hesitant about investing in eye creams, we hope this article has helped you better appreciate the importance of them! Besides eye creams, sun protection is just as important. Check out our list of the best sunscreens you need in Singapore. If you already have a skincare routine that you swear by, read our skincare guide for men in Singapore and ensure they’re giving their skin some much needed TLC too!